Chemagination offers bespoke investigations and solutions for R&D and manufacturing in the fine chemicals and pharmaceutical industries. Our service is based on a sound understanding of molecular behaviour, coupled with pinpoint analysis of the underlying chemistry and innovative experimental design. Every new project starts with a blank page: we define the target and analyse our starting point, then plot the most efficient route from where we are to where we need to be. In order to inform a recent IP lawsuit for a leading pharmaceutical company, Chemagination's Dr Nabil Asaad was tasked with establishing the mechanistic pathways operating in the manufacture of a proprietary medicine. 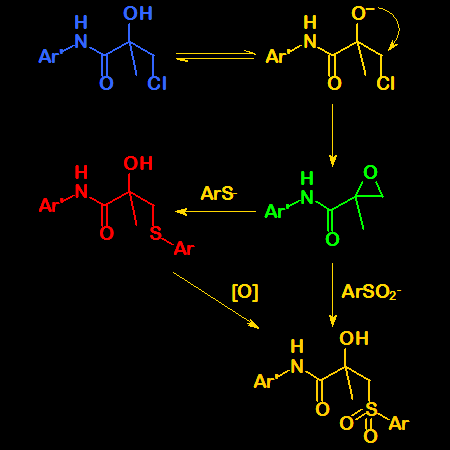 The synthetic route was for the preparation of a sulfone starting from a halohydrin (see scheme below). The specific areas of interest were (i) whether the expected synthetic pathway involving the formation of an intermediate epoxide dominated under 'weakly basic' conditions and (ii) whether the use of a sulfinate nucleophile rather than a thiolate gave rise to a novel mechanism or a substantially different process. To address the first issue required a kinetic study. 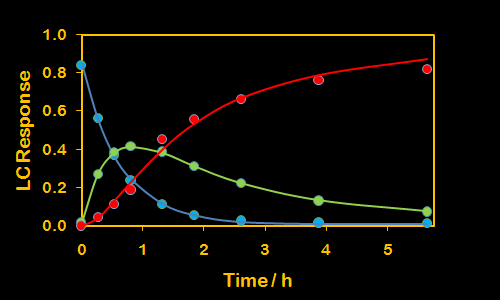 A series of experiments were conducted in order to quantify the dependences upon temperature and pH of the rate of formation of the epoxide from the parent chlorohydrin (see graphs below). These results indicated that in a production scale reaction, conversion of the chlorohydrin to the epoxide would dominate. Further studies on the epoxide-opening reaction and the two-step sequential process (see graph below) confirmed the expected mechanism and established that the alternative pathway involving SN2 attack on the chlorohydrin did not operate for either nucleophile. Demonstrating unambiguously that the processes involving sulfinate and thiolate nucleophiles are substantively the same ideally calls for observation of both reactions occurring under the same conditions. This has been likened to a race between a lion and a snail: the much lower nucleophilicity of the sulfinate, together with its limiting solubility, make its reaction several orders of magnitude slower than that of the thiolate. Under identical conditions with equal initial concentrations, the thiolate reaction would be complete before the sulfinate reaction had progressed to any significant extent. Detailed knowledge of kinetics and mechanism offered a way forward: the rate constants for both reactions were determined experimentally, thus allowing the establishment of initial concentrations whereby both nucleophiles could compete equally for reaction with the epoxide - this turned out to require a ratio of chlorohydrin to thiolate to sulfinate of 1 : 7.8 : 50,000. 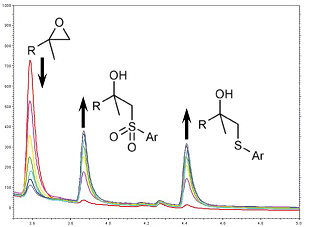 Such a competition reaction was then set-up in a 'one-pot' experiment (see serial chromatograms below). This 'one-pot' experiment demonstrated unequivocally that both nucleophiles react in the same way under the same conditions. The sulfinate reaction cannot therefore be regarded as a novel process. The mechanistic studies described above are published in Organic & Biomolecular Chemistry (click here to open in a new window). Chemagination is about adding value with definitive world-class science. The quality of the kinetic studies and rigour of the mechanistic analysis in the above investigation gave quantitative observations with no room for ambiguity. The above work exemplifies creative problem solving in action: whilst there were several possible levels of characterisation of the underlying chemistry, only by getting to the core of the kinetics, establishing the appropriate rate constants and knowing how to achieve chemical outcomes was it possible to envisage the final conclusive experiment. Our ability to understand the core of an issue and to offer rational strategies for resolution or mitigation, the quality of our science and definitiveness in its application, our accountability and desire to deliver the complete solution. We will bring enhanced expertise and new thinking in order to add value and deliver a better result. Chemagination offers advice and assistance on a wide range of subjects centred around chemical behaviour and outcomes. Our service is focussed on establishing client needs and the most appropriate way to address them. These can be discussed at an initial, no-obligation meeting, leading to agreement on the nature of the consultancy service required and how it will be delivered. Consultancy input might take the form of one-off guidance, report preparation, the undertaking of bespoke studies or a longer-term project. Chemagination will at all times be clear and transparent as to the nature of any work we will undertake for you and its anticipated cost, timescale and benefit. Please contact us to discuss what we can do for you (click here). © Chemagination Ltd (2009) all rights reserved.